Poetry. California Interest. Winner of the Berkshire Prize for a First or Second Book of Poetry. Occasioned by the birth of a first child and originally spoken aloud into a digital audio recorder on the poet's long commute between the art museum where he worked and his home in a neighborhood burned in the Witch Creek Fire of 2007, each of the poems in Patrick Coleman's first book resists the confusions of twenty-first-century parenthood, marriage, art, and commerce. 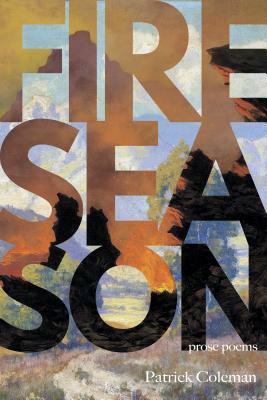 By turns conversational and anxious, metaphysical and self-mocking, celebratory yet permeated by an awareness of life's flickering ephemerality, FIRE SEASON is a search for gratitude among reasons to be afraid--and proof that a person can pass through the fires and come out the other side alive. Patrick Coleman is an editor for art publications as well as program manager of the Arthur C. Clarke Center for Human Imagination at the University of California–San Diego. He holds a BA from the University of California–Irvine and an MFA from Indiana University, and was editor/contributor for the exhibition catalogue The Art of Music and a contributor to Into India: South Asian Paintings from the San Diego Museum of Art. He lives in Ramona, California, with his wife and two daughters.